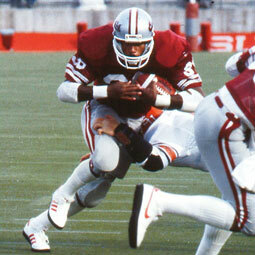 Rueben Mayes '92, '00 M.B.A, carries the ball in the historic 1984 game against Oregon. Photo Kevin Morris-U. Oregon. 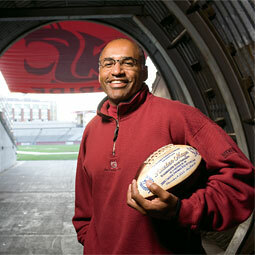 Rueben Mayes is the fifth Washington State Cougar to be named to the College Football Hall of Fame, joining coaches Orin 'Babe' Hollingberry and Forest 'Evy' Evashevsky, center Mel Hein '30, and tackle Glen Edwards '31. 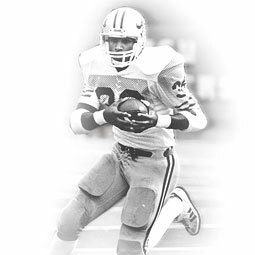 On a raw, wet fall afternoon in Eugene, Oregon, in late October 1984, Rueben Mayes' feet carried him to what was at the time the greatest accomplishment of any NCAA running back. 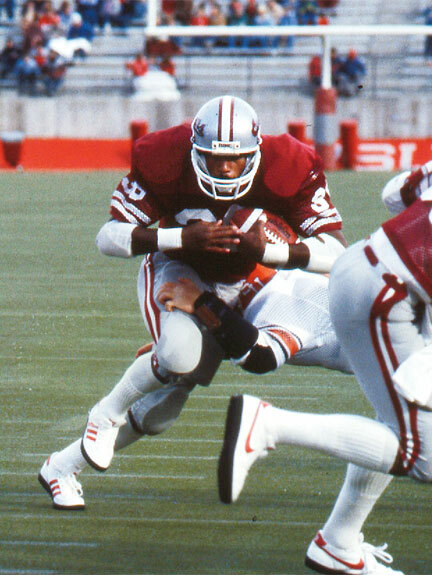 "The game against Stanford was one of his greatest efforts as a college player," says Mark Rypien, quarterback of the '84 team. But then he did one better. "The numbers that he had against Oregon were unbelievable." "Mayes was unstoppable that day," says then Oregon coach Rich Brooks, now the head coach at Kentucky. "It was a bizarre game in that everybody knew that they were going to give him the ball, but we couldn't stop him. He had one of those days." In leading WSU to a 50-41 win, Mayes ran for 357 yards--an NCAA-record--the majority of which came by way of the running play known as the draw. "The draw was just amazing," Mayes recalls. "Rich Brooks even talked about it afterward. Even when they knew we were going to do a draw, they couldn't stop it." "We must have run the same draw play 25 times," remembers Jim Walden, head coach of the Cougars from 1978 to 1986. "Rich Brooks said he got to the point where he hated the word draw." "All the fans in the stands were yelling 'Watch the draw!'" Walden recalls. "You could hear that word, 'draw!' and then we'd run it and he would make 8, 10, 20 yards. We just kept running the same play and when the day was over he had 357 yards." "We knew the draw was coming because we called it," Rypien said. "Everyone in the stands knew it was coming. That just goes to show you, you do the right things and execute properly, they can know what's coming, but you still have a great opportunity for success and that's exactly what we did." "I opened the box, and it had a football in it," says Mayes, who at the time was the senior director of development for the WSU College of Business before moving on to become the regional director of development for Sacred Heart Medical Center in Eugene this past July. "On the football it said, Rueben Mayes 2008 College Hall of Fame." Mayes recalls. "Then it had a letter congratulating me on my selection. It was an unbelievable experience. At first I didn't really get the connection, but then I realized that's what it was. "Having the football and having your name on there, that was really cool," Mayes adds. "I called my wife right away and told my sons that evening. I felt very humbled by the recognition." Mayes wasn't the only one relishing the experience. "I think I was prouder quicker than Rueben was," Walden says. "It was a proud moment for me because I never had one of our players go to the national hall of fame. I was thankful for him and appreciative of it, and at the same time, I kind of gloated around a little bit about the thought of being a coach that coached a guy going to the national hall of fame." It was Mayes' work-ethic that stays with Walden. "He just couldn't practice enough," Walden remembers. "Wind sprints didn't bother him. I can hear him and Kerry Porter now, laughing and giggling while running 40-yard dashes. All the rest of the guys are swearing under their breath but he just loved the whole thing." "We showed up to camp in much, much better shape than everybody else," says Porter, who played fullback alongside Mayes, in addition to rooming with him at WSU. "We were laughing because we were pushing each other but we were also way out in front." "I thought it was long overdue," Porter says of Mayes' selection. "Rueben is one of the hardest working people I've ever known. He's got a great attitude and demeanor, he is a fantastic teammate, he didn't let all the fame and good fortune go to his head." Rypien, who went on to play in the NFL and was a Super Bowl MVP, echoes his former teammate's sentiment. 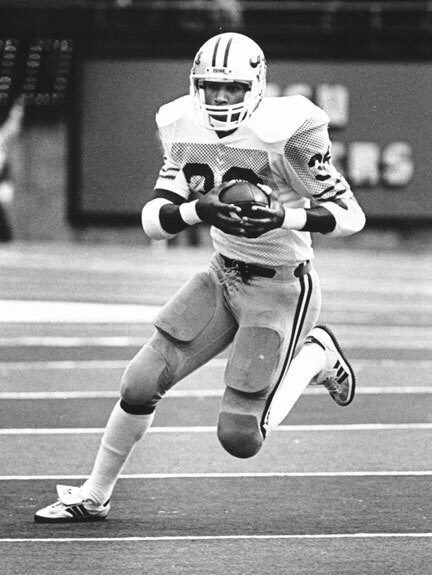 "For us bystanders on the outside it should have been done a lot sooner," says Rypien, who along with Porter and Mayes made up the famed "RPM" Cougar backfield of the mid-'80s. "He lit up the room by being very accommodating to everyone. There wasn't a guy on the team who didn't like Rueben Mayes. He was just a fun guy to be around. "Not only was Rueben a great physical athlete, but, more importantly, it was what kind of a guy he really is, and I think that signifies a very well-deserved induction into the College Football Hall of Fame," he adds. Though it has been more than two decades since he last donned the Cougar uniform, in a sense his collegiate career will come to a close at the induction ceremonies, says Mayes. "It is a wonderful way to cap off my college career."